Project: Tumor repressing effects of Estrogen Receptor β1 and oncogenic effect of the variants ERβ2, ERβ4 and ERβ5. A majority of breast cancers are dependent of estrogen receptor α for growth and survival. On the other hand, in prostate as well as in colon, estrogen receptor β appear to have a protective role against tumor development. Two main types of ER exist, namely ERα and ERβ. ERα is the dominating receptor in breast tumors whereas ERβ is the dominating ER in normal breast, colon and prostate. 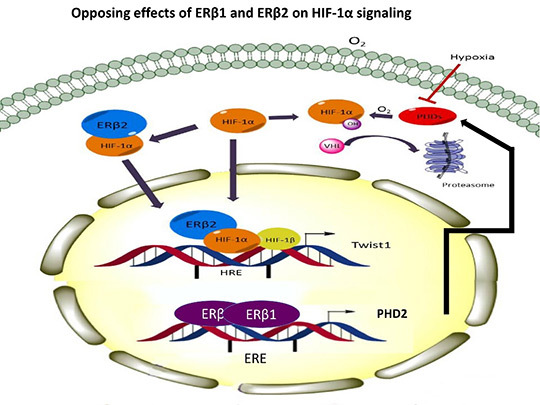 While treatment of ERα-positive breast cancer cells with estrogens results in proliferation, we have shown that expression of ERβ inhibits growth of breast cancer cells in vitro. Important factors regulated by ERβ involved in controlling the proliferation have been found to be c-Myc, Skp2 and p27 both in breast and colon cancer. There are strong indications that ERβ functions as a tumor suppressor in breast, prostate and colon cancer because clinical investigations show that expression of the receptor is lost during progression of these cancers. However, the receptor is re-expressed in aggressive prostate cancer. We have recently found the tumor suppressor gene FOXO3a to be regulated by ERβ in the prostate cancer and causing apoptosis through regulation of PUMA (see figure 1). We are now using CRISPR technology to isolate the receptosome on the FOXO3a promotor to be able to design better ERβ activating agonists for regulation of this gene. 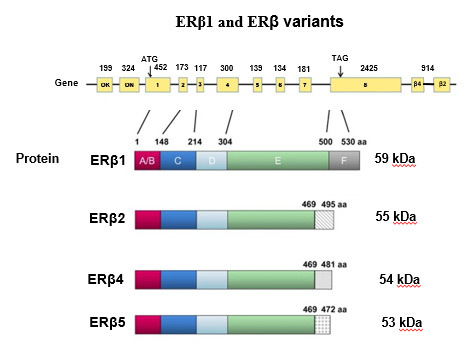 A second project is focusing on variants of ERβ1 the ERβ2, ERβ4 and ERβ5 which have a truncated c-terminal domain preventing normal receptor function (see figure 2). We have showing that these variants are binding to and stabilizing HIF-1α and HIF-2α leading to expression of HIF target genes which is increasing cancer growth and chemotherapy resistance (see figure 3). The variants have been shown to correlate to worse prognosis in many cancer types. We are using cells lines expressing the variants to learn how to design drugs to prevent their binding to and stabilization of HIFs. We hope to develop drugs which in the future can be used to prevent chemotherapy resistance in ERβ variant expressing cancers. 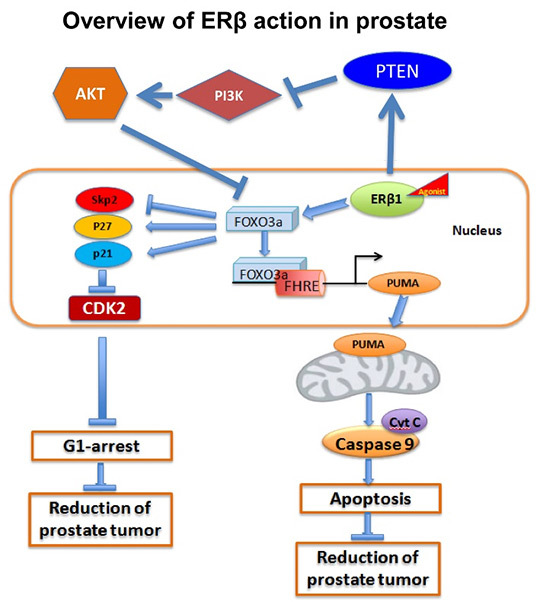 Dey P, Strom A, Gustafsson JA (2014) Estrogen receptor beta upregulates FOXO3a and causes induction of apoptosis through PUMA in prostate cancer. Oncogene , 33, 4213-4225. Dey P, Jonsson P, Hartman J, Williams C, Strom A, Gustafsson JA, (2012). Estrogen Receptors 1 and 2 Have Opposing Roles in Regulating Proliferation and Bone Metastasis Genes in the Prostate Cancer Cell Line PC3 . Mol Endocrinol 26: 1991-2003. Edvardsson K, Strom A, Jonsson P, Gustafsson JA, Williams C (2011). Estrogen receptor beta induces antiinflammatory and antitumorigenic networks in colon cancer cells. Mol Endocrinol 25: 969-79. Thomas CG, Strom A, Lindberg K, Gustafsson JA.(2011). Estrogen receptor beta decreases survival of p53-defective cancer cells after DNA damage by impairing G(2)/M checkpoint signaling. Breast Cancer Res Treat. 127, 417-27. Lindberg K, Strom A, Lock JG, Gustafsson JA, Haldosén LA, Helguero LA.(2010). Expression of estrogen receptor beta increases integrin alpha1 and integrin beta1 levels and enhances adhesion of breast cancer cells. J Cell Physiol. 222, 156-67. 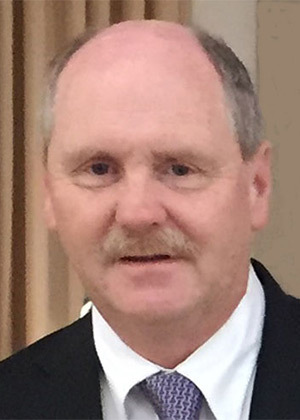 Müller, P., Crofts, J.D,. Newman, B.S., Bridgewater, L.C., Lin, C.-Y., Gustafsson, J.-A., and Strom, A. (2010). "SOX9 mediates the retinoic acid-induced HES-1 gene expression in human breast cancer cells. Breast Cancer Res Treat. 120, 317-326. Johan Hartman, Karin Edvardsson, Karolina Lindberg, Chunyan Zhao, Cecilia Williams,Anders Strom, and Jan-Ake Gustafsson. Tumor Repressive Functions of Estrogen Receptor beta in SW480 Colon Cancer Cells 2009, Cancer Research 69, 6100-6106. Müller, P., Merrell, KW., Crofts, JD., Ronnlund, C., Lin, C.-Y., Gustafsson, J.-A., and Strom, A. Estrogen-dependent downregulation of hairy and enhancer of split homolog-1 gene expression in breast cancer cells is mediated via a 3 distal element. 2009, J Endocrinology 200: 311-319. Hartman, J., Lam, E. W., Gustafsson, J. A. Strom, A. (2009) Hes-6, an inhibitor of Hes-1, is regulated by 17beta-estradiol and promotes breast cancer cell proliferation. Breast Cancer Res, 11, p. R79.